So the FBFF group has decided that on it's days off that members of the community will come up with different visual projects to share. This week's FBFF's Day Off is brought to you by A Pretty Nest. My bag....not very excited. I usually switch bags ever so often and for the past few days I switched to my brown Zara bag...anyway....the contents are always the same. 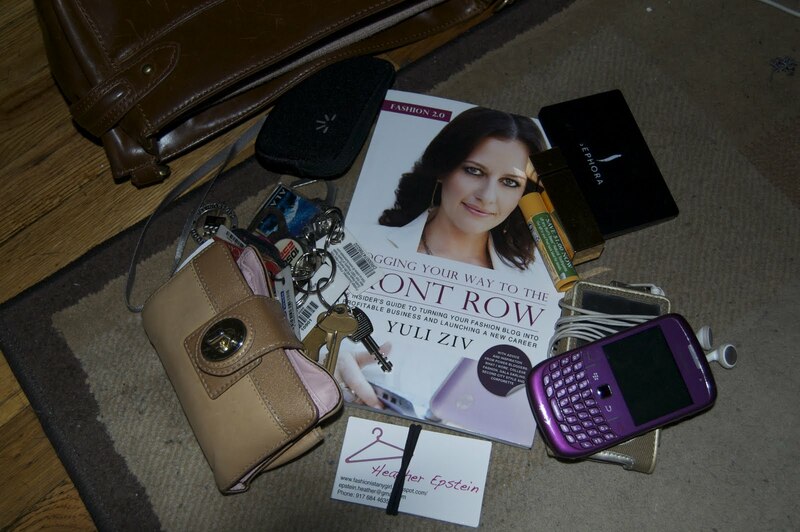 The 9 out of the 10 items can always be found in my bag. Okay 8 out of the 10 since I switch my lipstick around. Yuli Ziv's book is a new purchase which I bought yesterday at her Summer Soiree (which I can't wait to share with you) so that's the other one that's not always in my bag. I keep the bare essentials in my bag too. The book looks REALLY interesting though! I have Burt's Bees in my bag too! Definitely an essential. I soo need to try burts bee, everyones have it in their bag ! Love that wallet too ! Love how you take everything in your bag , mine is a pretty mess too with all that we might or might not need during the day. Vintage Shopping in Como, Fendi sunglasses from the 80s Let me know what you think. Have a nice weekend.